A modest pavilion provides an area protected from rain and wind, with space for all ancillary functions. It is not heated, but is protected against frost. 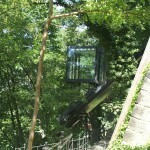 Travelling in the glazed cabin of the inclined lift offers an experience of the sce-nery as soon as the cabin emerges from the pavilion and moves, hovering above the slope, in the direction of the castle walls. 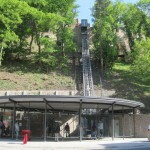 Practically without touching them, it stops just short of the walls so that you enter the town through the battlements without the need forany further interventions in the historicfabric. 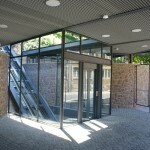 The upper arrival platform thus consists of only a door system and a threshold.